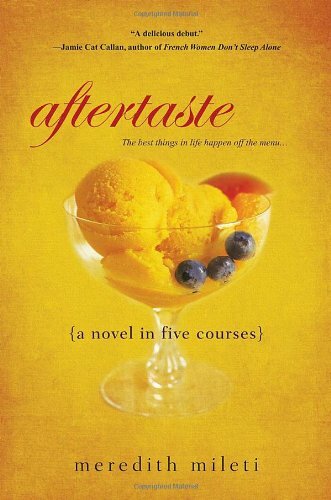 Aftertaste: A Novel in Five Courses, is chick lit with a vengeance. And I mean vengeance. Mira Rinaldi has a solid marriage, a successful career as a chef in her own, up-by-the-bootstraps New York Italian restaurant, and a beautiful, albeit demanding, baby. Well, two out of three isn’t bad. Jake’s cheating. And Mira’s been sentenced to anger management. What follows is the oft-told tale of the sadder-but-wiser woman rebuilding her life, sans man. Along the way, Mira’s forced out of her beloved restaurant, and it’s bittersweet when her contribution is only recognized when the quality goes down and the new owners not only want her to come back to run it, but want to build a franchise with her. Mira’s conflicted. Luckily, she comes to her senses and remembers what’s important to her. A life well-lived, doing what you love, is the best revenge. Mira’s voice is compelling, the story is sad, funny, wise, and witty in turns, and as she grows stronger in character, in friendships and in life, it’s a story worth reading. Will you learn something from this book? Probably not. Is the main character interesting/likeable? Yes and sort-of. Is the plot interesting? Sure! Will you tell all your friends they simply MUST read this book? Well, I’m not telling mine that. Does it stack up well against other chick-lit? Absolutely. This entry was posted in Commentary, Review and tagged aftertaste a novel in five courses, chick-lit, Meredith Mileti, Review. Bookmark the permalink.